NEW YORK (AP) — A union representing hundreds of Broadway theater cleaners, porters, elevator operators and bathroom attendants reached a tentative agreement with theater producers to avert a strike, both sides said Monday. The potential deal must still be ratified by the 250 theater workers represented by the 32BJ union, a process expected to be completed by next week. Details of the deal were not immediately revealed. "This is a fair agreement that addresses the concerns of our members, the men and women who work hard every day to keep theaters safe, clean and running for the millions of theatergoers who come to Broadway from around the world," said Shirley Aldebol, vice president of 32BJ. Members of the union last week authorized a strike if an acceptable new deal wasn't reached by the end of the year. The current contact ends Dec. 30. Workers are seeking pay increases and better health care benefits. The Broadway League, which represents producers and theater owners, said the tentative agreement came after productive negotiations. Any strike would have affected workers at 32 of Broadway's 40 theaters where the 32BJ has a contract, including all the Shubert, Nederlander and Jujamcyn-owned theaters, as well as the Circle in the Square Theatre. The most recent major strike on Broadway was in late 2007, when a 19-day walkout dimmed the lights on more than two dozen shows and cost producers and the city millions of dollars in lost revenue. The 32BJ, an affiliate of the Service Employees International Union, has more than 120,000 total members, with most concentrated in the Northeast. It represents janitors, property maintenance workers, doormen, security officers, window cleaners and food service workers. 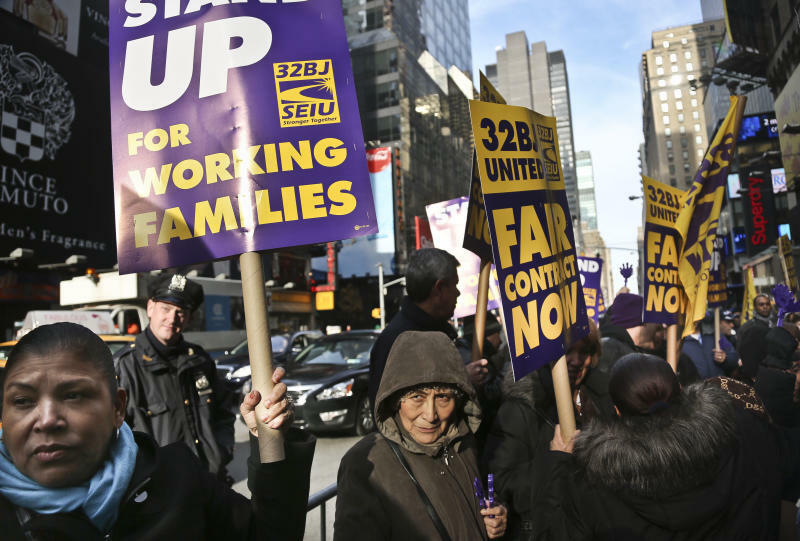 The Coalition of Broadway Unions and Guilds had backed 32BJ in its strike authorization.